On June 14, quite an interesting event is expected to take place in Belin, where still unknown to us “experts” will discuss… the participation of the Ukrainian special services in the murder of Nemtsov. It’s interesting that “the International conference” of the so-called “Eastern objective” group with a notorious title “We know the killer of Boris Nemtsov” was scheduled for June 7, but then it was postponed for some reason. Who is ready to deal with Markov? A few days earlier the Ukrinform news agency received an interesting document. The announcement of a "conference" by an unknown “Eastern objective” group that word for word repeats the theses by Kremlin political analyst Sergei Markov, which had been published two weeks ago on popular radio "Echo of Moscow". Mr. Markov stated about a Ukrainian trail, about the alleged “SBU involvement in the murder of Nemtsov". This statement can be attributed to the inadequacy and traditional anti-Ukrainian improvisation by Markov, but persistent spread of information in the Russian media, including banners on many popular media resources, meant the story would be continued. And it did not take long – the continuation is to take place in Berlin. Sergei Markov even in Russia is a person with a totally tarnished reputation, and the same is abroad. Odious, even not a loud-hailer, but Putin's dump tank, a prophet of "nuclear war in Ukraine" and "a witness of genocide of Russians" has not any scientific or political reputation in any country. 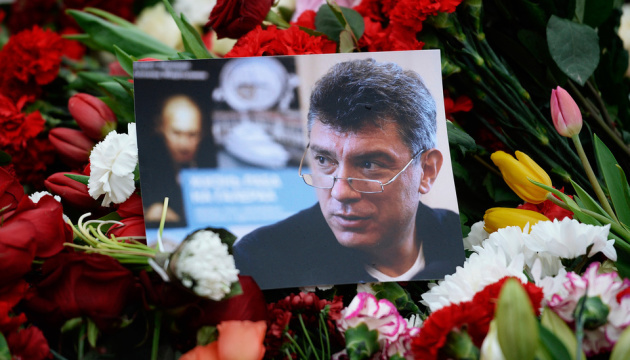 According to the announcement, the “Eastern objective” group states that the Ukrainian special services are “guilty” of murdering Nemtsov and that the SBU allegedly “via domestic political unrest in the neighboring country, Russia, (“Moscow Maidan") in February 2015 tried to get a key to settle the Ukrainian conflict. This group frightens that the realization of SBU plans and scenarios would have led to "an explosion inside” Russia, which a nuclear state. Thus, they warned the European community "about these possible scenarios from the side of other intelligence agencies." According to our data, Robert Stölzl, an Austrian radical, who has been cooperating with Russia for a long period of time, was expected to be the chief rapporteur at the conference. His latest report was about " successful economic development” of Crimean peninsula after the occupation. However, the reputation of Mr. Stölzl is so dubious in Europe, political and scientific circles that it was decided to replace him with a German journalist, Wilhelm Dietl. Ukrinform’s Berlin bureau decided to find out about the person of Wilhelm Dietl. He has long positioned himself as the founder of IFTUS Institute in the city of Essen. According to our information, this is IFTUS that should have become the "scientific undercover" of the report. We contacted the Institute asking whether the institute was involved in this event. IFTUS and its head denied its involvement both in the presentation and participation in preparations for the report. We were told that the Institute had not been cooperated with Dietl since 2006. A spicy detail: from 1982 to 1993 Wilhelm Dietl had been working in the Federal Intelligence Service of Germany (BND). Dietl writes about himself with false modesty: “From a local editor to the chief reporter of weekly magazines. I worked in the Middle East for the BND intelligence. Twelve years of work for FOCUS magazine, besides fifteen books." He has written 15 books, but only one of them - "Covername: Dali” is about his espionage past. It should be noted that his former colleagues didn’t approve such a combination of professions. Dietl had been working for 10 years at BND and eventually accused the structure of making him a "victim", by revealing the fact of his belonging to the BND to employers from the journalistic environment. Former colleagues of Dietl from FOCUS magazine describe him as "dishonest journalist," "capable to tell anything for the money," who is associated with many scandals and who "grossly violated journalistic ethics." He was fired from FOCUS, as well as from the Institute because of scandals. "He is kind of a person that people are looking for at present, because respectable people do not join such events", a journalist (who worked with Dietl at the magazine and who wanted to remain unknown) and expert on the former Soviet Union countries said in a private conversation. We sent a letter to Mr. Dietl. There has been no answer yet. When asked by Ukrinform’s correspondent in Berlin to comment on a recent version of the “investigation” into the murder of Boris Nemtsov, his daughter, Zhanna Nemtsova, said shortly: “I have never heard the name of this man and this institute till now. I don’t even consider this version worthy of any discussion”. Joerg Forbrig, chief scientific official at the German Marshall Fund, agrees with Jakub Janda: “I have never heard of this institute, nor of the people involved including the author of this research. From looking at their website, it is also hard to see what they have ever done other than one publication”. At the same time, he says he have heard about the main rapporteur: “I do note that Wilhelm Dietl has a complicated history with Germany’s foreign intelligence service – he was recruited as an expert on the Middle East and Asia but fell out with the BND in 1993. None of his publications suggest any expertise on Ukraine or Russia,” Forbrig added. Our summary: It’s becoming more difficult, almost impossible for Russia to find experts with a decent reputation, who are ready to falsely discredit Ukraine. There are no people either in France, or in Germany who are willing to distribute fakes. Only those people who have nothing to lose in terms of reputation are whiling to be transmitters of Lubyanka [Russia’s Federal Security Service]. P. S. Yesterday, the German Bureau of Ukrinform received a phone call from Mr. Dietl. He said he received our letter, confirmed that the "conference" on the murder of Nemtsov would be held next Tuesday in Berlin, and even allowed us to attend it.